is honored on Panel 43W, Line 47 of the Vietnam Veterans Memorial. Pfc. 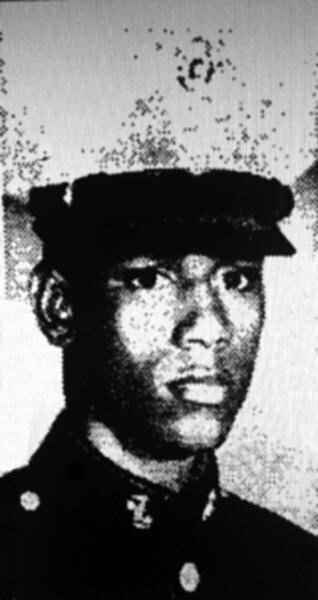 Ronald W, Lewis, USMC, 19, died Sept. 20 in Quang Nam Province, Vietnam, as a result of head and body wounds received in combat. He lived at 4332 Gault Place NE. Pfc. Lewis, a native of Washington, attended Spingarn High School. He joined the Marines last November and went to Vietnam in April as a grenadier with Co. G, 2nd Battalion, 7th Marines, 9th Marine Amphibious Brigade. He leaves his mother and step-father, Mr. and Mrs. David Taylor; two sisters, Mrs. George Hill of 177 Joliet St. SW and Patricia Lewis of the Gault Place address; a stepbrother, David Taylor Jr. of the Gault Place address and his grandparents, Odell Lewis and Mrs. Viola Lewis, both of Washington. Friends may call from 5 to 10 p.m. Sunday at the Rollins Funeral Home, 4339 Hunt Place NE. Services will be at 11:30 a.m. Monday at the Bethesda Baptist Church, 1808 Capital Ave. NE, with burial in Arlington Cemetery.